I missed last week's film reviews due to focusing heavily on Infinity War. I also didn't have much new stuff to review, as I focused on catching back up on the MCU. However, this past week I have been back into watching a lot of new films and I want to review them with you. Since I have four new films to review, I want to keep it to the new releases. I will however touch on my second viewing of Infinity War, as both showings were in the past week. Doctor Strange (2016), directed by Scott Derrickson and starring Benedict Cumberbatch, Rachel McAdams and Chiwetel Ejoifor is the 14th film in the Marvel Cinematic Universe. The film centres around Doctor Steven Strange as he gets into an accident that damages his nerve endings in his hands, making him unable to continue being a doctor. With this, he finds the power of magic and pursues another career. 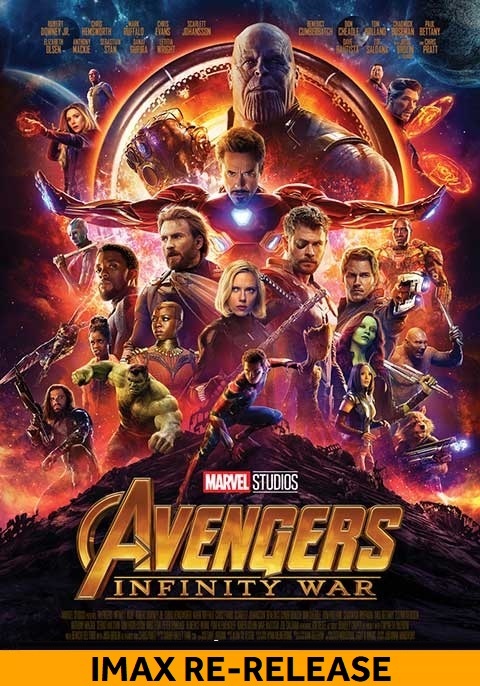 This was the final movie in the MCU that I needed to watch before seeing Infinity War. I am glad that I waited until closer to the time to see this film, as this entry turned out to be vital to understanding the stakes of Infinity War. What makes this film is the style. The cinematography matches that in Inception, and that is a clear comparison that can be made. I also loved the special effects done in terms of the powers that are used throughout the film. To go from the super-hero aspects in the other MCU films to now making a magic-based film gives the MCU a new breath of fresh air and I loved that. Benedict Cumberbatch is a fantastic lead and fits into the world of Marvel perfectly. It did take a little bit of time to get used to his New York accent, but he was the perfect choice for this wizard. he is narcissistic, a bit arrogant and a perfect character for Cumberbatch. This film is flawed in something that the MCU suffers from in previous films: the villain. Before the surge of great villains in Phase Three (Killmonger, Thanos and Vulture), Marvel could rarely develop a great villain and this one is so forgettable. He could be replaced by anyone else and there would not be a change in pace or emotion. Overall, this is a great film from the MCU. It benefits from being a different style of film in a line of generic superheroes. I feel there were places where it could have been improved, but it is a great origin story and a vital point in Infinity War. Ghost Stories (2017), directed by Andy Nyman and Jeremy Dyson and starring Andy Nyman and Martin Freeman is a horror drama piece that presents itself as a documentary. The film centres around Professor Phillip Goodman, a psychologist that goes after the supernatural and debunks it, as he goes through three cases and tries to solve them. I had no idea what I was going in for when I went to see this film. The premise of having three stories connected together sounded very interesting to me, and if you know me you know that I absolutely love horror films. This film has me conflicted in multiple ways. For the first half, I was so confused that it nearly lead to boredom. There seemed to be no connections, and it felt off pace completely. I loved the cinematography, and how the characters were written and reacting. However, a total tonal shift happened in the second half that jolted me up and got me entranced in the world. The acting is absolutely superb. You can tell this is based on a screen play, because it does feel like it could be done on a stage in front of a live audience. It is that type of drama piece. It never took me away from the story though as it was fantastic. This is a film that I could not even explain what happens at the end, because you need to watch it to understand it. It could be seen as a general trope of the genre once you watch it, but it is so well executed and gives such a powerful message. This film definitely isn't for everyone. It presents itself as a documentary and at some points it fails in that regard as the characters are generic and have no personal touch to them. Other than that though, it is a solid thriller that kept me on the edge of my seat with stunning cinematography and a haunting story that feels complete. Gifted (2017), directed by Marc Webb and starring Chris Evans, McKenna Grace and Jenny Slate, is a drama about a girl whose mother has died and is truly gifted. It is up to her uncle to raise him and make some big decisions that can affect her future. This is a film that I have wanted to watch since I heard about Evans' involvement. Sure, I obviously love him as his role of Captain America, but I have also watched him in his directorial debut Before We Go and I thoroughly enjoyed the direction that he took. This is a nice, simple film. It doesn't try to over-complicate itself by being big. Whilst these films don't go to make a lot of money, they deserve a lot more recognition for what they achieve. The acting is superb from the entire cast. This is the debut from McKenna Grace and she is shaping up to be a fantastic young actress. She has since been in I, Tonya and I cannot wait to see her in future films. Her and Jacob Tremblay are shaping acting for the future generation and I am excited for it. Chris Evans is fantastic in this film. It is nice whenever I get to see him in a role outside of Captain America as he can do any role that he wants to. The supporting cast throughout is also fantastic. There isn't much else to say about this film but it is definitely one that everyone should check out if they can. Whilst we all love a big blockbuster, it is nice to slow down and watch a little film once in a while. The Florida Project (2017), directed by Sean Baker and starring Willam Dafoe, is a drama that follows a broke family on the outskirts of Disney World, Florida. Throughout the film, we see the mother doing whatever she must to make enough money to stay on the estate whilst her daughter acts like a regular kid, explores the perimeter and lives outside of the broke world she has to be in. Before I talk about why I did not enjoy this film, I am going to talk about the couple of things that were done fantastically. I absolutely love the cinematography, it was stunning and captured the surroundings. Speaking of surroundings, the set was well realised and was so pleasing to look at. As well as that, all of the acting was well done. The kid actors feel genuine and have a big future ahead of them. Whilst Dafoe was the one who got the Oscar nomination, I feel like Bria Vinaite was the person that most deserved an Oscar nomination here. Her performance is so dramatic and powerful, that you really see the film from her perspective. Despite all that though, I just did not enjoy watching this film. It just felt like it dragged on and on and on, and that is because nothing essentially happens in this film. There is a big moment at the end, but it so much awkwardness and waiting around purely for one thing to happen. As well as that, I just could not like any of the characters. I felt that the characters were written with a distasteful manner to them, and I just wanted someone to have a bit of respect. The kids, whilst being young and innocent, felt naive and sometimes a bit stupid. I get it, they're kids, but for the first 30 minutes I really could not like the kids at all. It also felt out of place. Characters would jump in and out with no explanation, people got treated disrespectfully for no reason, and it just felt completely awkward to watch. I know people love this film. This is a film I was so excited to see and that I wanted to love so much. This is a risky film, and it knows that. I appreciate that it was made and loved by many, but sadly I am just not one of those people who loved it. I saw Infinity War for the second time on Friday, the day after the film was released in the UK. I feel like this is film that needs to be seen at least twice to take everything in. So much happens in Infinity War that things will seem better the second time, and other things will pop out as out of place the second time. The second time round, I got less annoyed with the ending. I won't spoil anything, but I accepted that it is a set-up a lot more this time around. I also understood some characters decisions more this time than the last time. I do find the pacing to be a bit off the second time round. It highlighted several scenes that I feel could have been longer, and other scenes that were either too long. No scene was unnecessary, I just felt that length was the big issue here. For me, this is a great Marvel film. I don't think it is in my top five, but I did fully enjoy it and it is definitely top ten material. This film may end up being top five once Part Two is released, but for now this is a fun flick that everyone needs to experience in the cinema. In weeks like these where I do two weeks worth of reviews or where I have a lot of new films, do you want me to talk about films I have already seen? Or would you rather that I give longer reviews on my new watches and big releases? I am interested to see what you would rather see. I will make sure to continue reviewing these films on a weekly basis from now on. Sunday will be another Infinity War article, but I can assure you it will be the last full Infinity War blog post that I make for a long while.